Welcome to another Becoming a Modern Man! It's been quite some time since I've added another article to this series. I always like to keep up with my favourite format though and had to tune into Pro Tour Oath of the Gatewatch to see how the new format would shape up. I have already expressed my thoughts on the Pro Tour results here, so I won't go much further into them here. However, the story of the tournament was that the Eldrazi deck dominated. With no emergency bans in sight, which was never realistically going to happen, we are now having to see how the format adapts to the dominating Eldrazi deck. One deck that has been suggested is Jeskai Control and both Pascal Maynard and Kyle Boggemes have written recent articles about the deck. I was curious as to how well an actual Control deck could do in this kind of environment, so that is what I am bringing to you. I decided to use Kyle's amended list from his article for my testing, which also came with a handy sideboard guide for some key matchups. Kyle's deck focuses more on having early answers and interaction than some of the other versions of the deck. Pascal's deck is running more copies of Cryptic Command and even has Sphinx's Revelation. Pascal's deck also favours Vendilion Clique over Blade Splicer which is a trade I wouldn't be against making. It has been suggested cards like Supreme Verdict and Gideon Jura could be good against Eldrazi but I assume they are being eschewed here due to being too slow as answers. 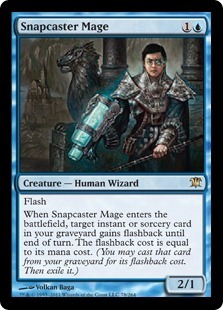 Snapcaster Mage is an amazing card in this type of shell. 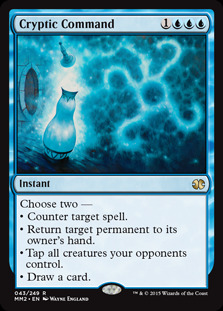 You can get a lot of value from reusing your countermagic and burn and you get a 2/1 to carry on the beats. You can also blink the Snapcaster Mage with Restoration Angel to gain even further value. Blade Splicer is a card I haven't seen in this type of deck for some time. 4 power for 3 mana is a great deal and the first strike on the Golem makes it a formidable in attack or on defence. Splicer also works really well with Restoration Angel as making multiple Golems can easily take control of the board. Angel is a card that has fallen out of favour in Modern, which is a shame as it remains one of my favourite creature cards. A sizeable threat in the air playable at instant-speed makes Angel very strong and that is before we get to the interactions with its blink effect. 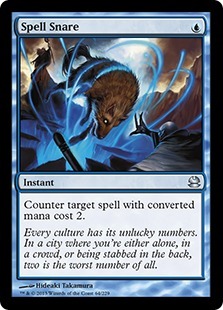 Reusing the ETB effects of Snapcaster Mage and Blade Splicer is just huge value. The deck has a fairly sizeable burn suite. It's not as all-in on the burn strategy as some other versions of the deck I've seen in my time but it is certainly packing a lot of heat. The burn spells are removal to help control the board but also give you reach as a means of winning the game. They are also amazing with Snapcaster Mage, as refusing your burn spells is fantastic value. Path is a card that has seen its value increase since the rise of the Eldrazi decks. A one mana answer to pretty much any of their threats is very solid. Granted they will get a land to play more big threats but it's still great value compared to their investment. At the time of writing it seems that Eldrazi decks themselves are adopting Path to Exile to help combat the mirror. This is the deck's suite of counterspells. 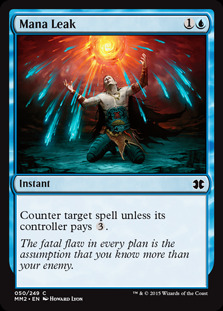 Countermagic control is not really what this deck is going for, with no copies of Remand in sight. Kyle advised that he felt Remand was bad in a field laden with Affinity, Burn and Infect decks (the majority of the non-Eldrazi field from the Pro Tour). Also, he expressed concerns about being able to actually take advantage of the tempo boost with this deck. So the counters here in general are as close to hard counters as possible at a reasonable price. Mana Leak loses value in the late game but Kyle described it as a necessary evil. Cryptic Command does so many different things and is incredibly versatile. The curve of this deck is far lower than some other Control decks which seems to be a response to the speed of the current metagame, so unfortunately we really only have room for 1 copy. Spreading Seas is the new technology, or old technology I guess, to tackle the new format. Spreading Seas provides an answer to Eye of Ugin and Eldrazi Temple, creaturelands or can just deny an opponent access to the mana that they want. With fewer blue decks around Spreading Seas can be a lot more potent than it would have otherwise been as your opponent is less likely to have a use for the blue mana. Visions is one of the best cantrips available in the format. It draws you a card and allows you to manipulate your library to set up your future draws. A great way to set up the direction your game is going to go. Colonnade is probably the only real land of note here. Colonnade is a fantastic late game threat and gives the deck a lot of reach as it marches on into the late game. Unfortunately, there are a lot more Ghost Quarters running around in the format as well as other non-basic hate, primarily to deal with Eldrazi though Eldrazi also runs Ghost Quarter main deck, which may limit the effectiveness of Colonnade. However, that is by no means a reason not to run it as it is tremendously powerful when they don't have such an answer. Geist of Saint Traft is an excellently aggressive 3-drop. It is very difficult to deal with beyond blocking it so if we can clear the way Geist will finish the game quickly. Geist usually comes in against decks that are heavy on targeted removal and where we want to wrap things up quickly. Dispel and Negate add more counterspells to the deck. These are particularly good against combo decks. 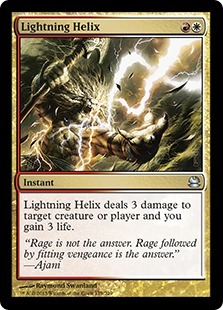 Lightning Helix is additional removal and a source of life gain against aggro and burn. It can buy a substantial amount of time for you to stabilise. Path to Exile helps deal with the larger creatures in the format that you can't just burn. Very useful against Eldrazi as a cheap answer to their threats. 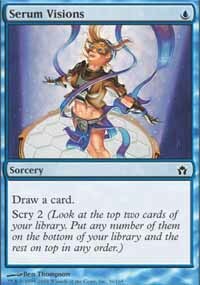 Detention Sphere catches a lot of other problem permanents and is a very versatile card to have in the sideboard, if not the most out and out powerful. Crumble to Dust is a great card against Tron as hitting it will stop their crazy mana. I thought this would also be directed at Eldrazi but Kyle actually didn't even advise to bring it in. 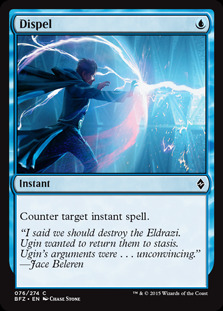 As an answer to the Eldrazi lands it is a little slow but permanently getting rid of Eye of Ugin could be useful. I'm trusting Kyle's judgment on this one but I think if you are running this it should be targeted at Eldrazi as Tron is not super popular at the moment. Stony Silence is a great way to shut down Affinity (which I imagine will be the second most popular deck in the new metagame), turning off their creatures activated abilities and the decks enablers like Cranial Plating and Springleaf Drum. The card is also pretty strong against Tron as a way of turning off their Chromatic Spheres/Chromatic Stars/Expedition Maps etc. So lets see the deck in action. I hope the videos are ok. I had to update my recording program and had a few issues while recording but hopefully these came out well enough. I played a variety of different matchups testing this deck out and some of my exploits are below. I thought I'd write about how I felt the matchup went and also give some sideboarding ideas where possible. Our first matchup is against Jund. 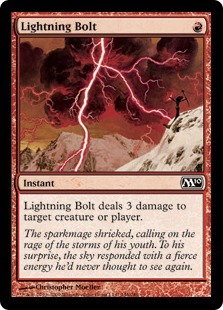 Jund is a strong combination of disruption, removal and powerful creatures which can be hard to contend with. I like this approach. Geist of Saint Traft can be extremely powerful against them as can be seen in Game 2 of this match. A disastrous mulligan to 5 came up trumps when we dropped a Geist and our opponent, presumably with a fist full of targeted removal had no answer. We also have enough removal to answer most of their threats but Path helps deal with Tarmogoyfs and other things that can get out of hand. The counters are dropped a bit as their hand disruption allows them to play around countermagic and so this a more proactive and aggressive strategy. Our second matchup is against Living End. This was not a matchup I was relishing. As our Jeskai Control deck is more burn based than counter-based we are a bit weak here. Remand is fantastic against Living End but we aren't running it. Fortunately our deck is versatile and has a lot of game even in difficult situations like this one. 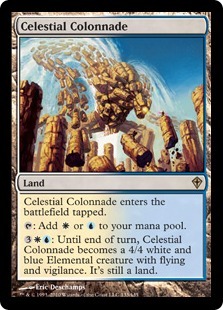 Celestial Colonnade is very strong here if we can draw the game out as a way to fly over their threats, however, the longer the game goes the more potent a Living End can be. Spell Snare is instantly redundant here as all their spells cost 3 or more. Dispel isn't at its most useful but it does counter Beast Within and Ricochet Traps that they will likely bring in post-board. 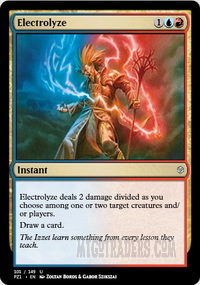 Perhaps some number of Electrolyze and Spreading Seas can come out here as neither are particularly powerful but they do provide card draw. Negate definitely makes it in as a hard counter for Living End. 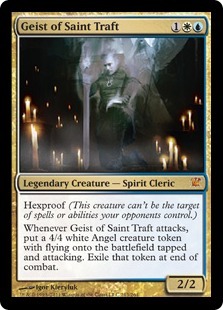 Geist of Saint Traft might be a good choice as a must answer threat that cannot be hit with Demonic Dread, though it does mean tapping out early. 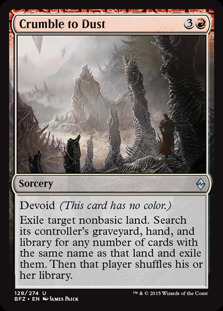 Detention Sphere and the extra Path to Exile might also be good a ways of dealing with creatures without sending them to the graveyard. Our third matchup is against Bogles. This was another matchup that I was not exactly pleased to be sitting on the other side of the table from. Bogles is hard to interact with and again our deck isn't particularly well set up against it. Spreading Seas actually did a surprising amount of work here as it made it difficult for our opponent to cast multiple spells and could let us turn off copies of Horizon Canopy. This match was intensely close but we managed to drag out the win. 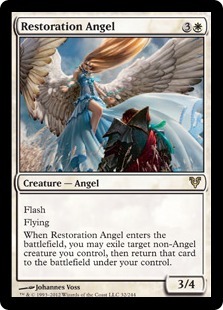 Blocking and blinking with Restoration Angel is a nice little strategy provided they haven't managed to give their Hexproof creature trample. In terms of sideboarding, Path to Exile isn't very useful except for dealing with Kor Spiritdancer but our burn spells can deal with that as long as we catch it early enough. Dispel probably also wants to go though it can counter Path to Exile to protect our creatures. Detention Sphere comes in as one of our few answers to dangerous auras. Negate is a good counter for their auras too. Extra copies of Lightning Helix can make up for the lost copies of Path. So here is the menace and the match we wanted to test. This match was very interesting. Spreading Seas managed to work wonders in Game 2 but I think I got pretty lucky that my opponent never drew a second Eldrazi land and things still managed to be very close despite forcing my opponent to play fair. Game 3 we just get steamrollered despite an exciting hand on the draw. Eye of Ugin into Eldrazi Temple into Thought-Knot Seer on the play is just crippling even when you have hate. There was just no way to match or respond to that advantage and I was subsequently crushed. Kyle recommended taking out some of the one mana spells to avoid being crippled by Chalice of the Void for 1. I'm not sure about bringing in Geist personally as I'm not sure how it fares up against Eldrazi Mimic, Matter Reshaper or anything bigger. 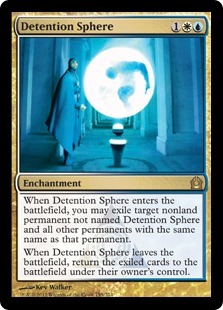 Detention Sphere seem like a reasonably solid answer to their larger threats or if you get stuck under a Chalice. I also found it interesting that Kyle doesn't bring Crumble to Dust in here. Perhaps it is just too slow but in that case other than Tron I don't really know what it's there for. Our final matchup here is against RG Tron. Tron didn't fair too well at the Pro Tour so I wasn't really inspecting to see much of it. The deck does seem to have evolved somewhat, being able to search up World Breaker with Eye of Ugin as an answer to various problems. I find taking out the burn a little controversial as that is good reach for us but we are bringing in a lot of exciting cards for this matchup. Stony Silence can be very strong against them, turning off Chromatic Star/Chromatic Sphere and all their other artifacts. It is a lot better dropped early though as it is somewhat redundant later. There are some other nice answers here and we already have main deck Spreading Seas which is useful against the Tron lands. This deck was a lot of fun to play. I enjoy a good Control deck and I am glad that some people are still trying to make them work, even though I fear the current metagame is probably not the most inviting for Control. The deck is solid and has a lot of play to it meaning you can work your way out of even sticky situations like the Living End and Bogles matchups that we faced. Spreading Seas is pretty good in the current metagame but I don't think it is quite sufficient as a standalone answer to Eye of Ugin and Eldrazi Temple. It's just too easy for them to topdeck another Eldrazi land and undo all your hard work. As a way of stalling the game though it is useful and I guess that is what we are looking for it to do here. We still have a bit of a problem though as they have so many large creatures to deal with so it's not like simply drawing them into the late game is necessarily good enough. Control decks have always had a rather tough time trying to get a handle on Modern and I feel the format may be even more hostile than usual to Control decks. I think we need more commitment to beating Eldrazi which feels like it is missing from this deck beyond Spreading Seas. I'm not entirely sure how I would change to deck though - which is one of the problems with playing against Eldrazi in general, it's hard to find any truly amazing sideboard cards against it. Perhaps more testing against Eldrazi would reveal better results but the matchup still seems rough to me.